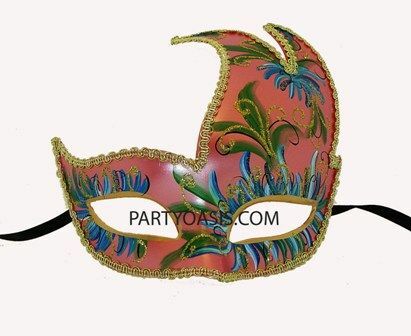 Hand painted Venetian mask is made out of lightweight plastic, molded into a half moon shape Decorated with a whimsical floral design and outlined with gold trim. Perfect as a part of Carnival, Halloween, Masquerade, or Mardi Gras costume or could be an amazing addition to your collection. Mask has two ribbons for wearing.